I have been a part of the Learning Garden for just over seven years, almost every month it has been in existence. I was not here at the beginning, but I have a credible amount of service in this Garden which makes me uniquely qualified having viewed the Garden's growth from almost the very beginning..
Over those years, a volunteer or two have come along and worked very hard on a facet here or a facet there of the Garden - and at some point have reported to me and others that they 'built The Learning Garden." What makes it all the more astonishing and poignant is that the one person who could really say that, hasn't. Operating mostly off site, in her home office a few blocks away, the real person who "built The Learning Garden" is Julie Mann, one of our founders and still serving on our Board of Directors as our Treasurer. 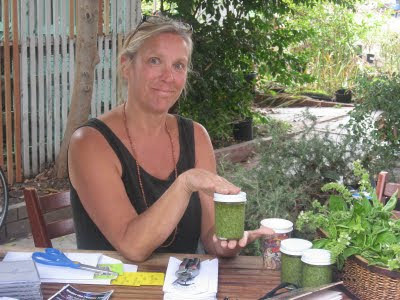 Julie has written grants, sought funding, mediated disputes, cajoled reluctant participants to fulfill their promises and countless other tasks (like hawking pesto in the above photo) that remain largely thankless, day in and day out. Year in and year out. For longer than I have been here. So when you hear someone say how important they are to The Learning Garden, they aren't. The only one who can claim that title doesn't say it. This little post doesn't acknowledge Julie enough, doesn't do her justice. But really there is nothing we could do to really express our gratitude for all of her work and efforts to truly "build The Learning Garden." And any post that exculpated all the work Julie has done, would go way too long for this writer who is due at 'work' soon. Thank you and Happy Birthday, Julie!